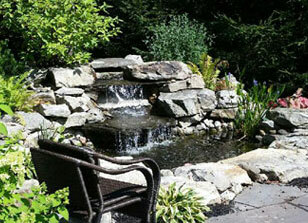 Kohut & Son Landscaping is a full service, fully insured landscaping company who has been serving the commercial and residential sectors in Boonton Township, NJ and the surrounding areas for over 30 years. We are a family owned and operated business committed to providing the highest quality service to our clients. Kohut & Son Landscaping provides a multitude of services covering everything from landscape design to snow plowing. 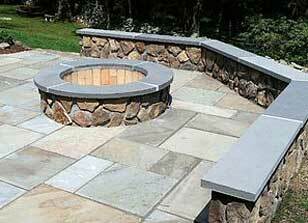 We specialize in original planting design and landscaping architecture, custom stonework, natural and mortar stone walls, all types of patio stone and pavers, koi ponds, waterfalls, drainage, full service property maintenance for residential and commercial properties, mulch and snowplowing. With over 40 years of experience in the industry, our professional staff will work with you to make sure that you get the results that you are looking for. 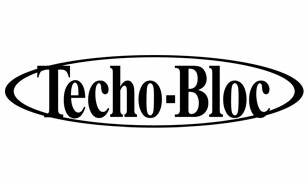 Call or e-mail us today to discuss your next project! "John Kohut (the “& Son”) and his landscaping business were introduced to us as we were making plans to replace our 30-year old deck and add a patio..."
"John Kohut (the “& Son”) and his landscaping business were introduced to us as we were making plans to replace our 30-year old deck and add a patio adjoining the deck at the back of our 1912 Hapgood house. The deck was rebuilt by Bob Gibbons Builder (see review), and the major task of turning a sloping patch of grass, tiered garden, old unsteady stone walls and stairs, and uncertain below ground structures, into a patio with stone retaining walls, was done by the Kohut firm, with spectacular and thoroughly satisfying results. John talked with us about what we wanted to have accomplished, listened carefully to our responses, and succeeded in designing and creating a space that is a natural and comfortable fit for us. His vision, design expertise and enthusiasm for rock work and plants has given us a delightful backyard. John’s team, including his father on the excavator and many eager young men, did a great job removing earth and rocks from the patio site, filling in an old underground space, rebuilding garden walls and stairs, constructing stacked rock retaining walls, and artfully building the bluestone patio with permeable joints (for drainage), making an eye-appealing, well-sized outdoor living space. Subsequently John renewed a grass area with sod, framing the patio and deck, and providing access for lawn mowers and carts. He replanted the gardens, moving and reusing many plants as well as providing new ones. Kohut Landscaping does our weekly lawn mowing and maintenance, seasonal clean-up, and periodic plant care. John has limited his customer base so as to appropriately and personally oversee his jobs. 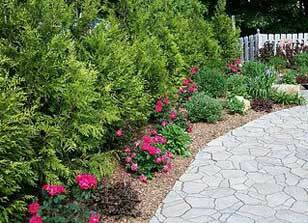 He has been highly attentive and easy to reach when questions or ideas arise about any phase of landscaping. We could not recommend him more highly. If he can take you on as a customer, seize the opportunity!" 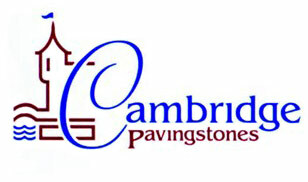 "We had a natural stone retaining wall that was holding up the driveway, it was deteriorating and needed to be redone. We had wanted to keep the natural..."
"We had a natural stone retaining wall that was holding up the driveway, it was deteriorating and needed to be redone. We had wanted to keep the natural look and had received a few quotes none of which would have kept the natural stone look but would have put a block wall instead. Kohut came highly recommended and we could not have been more pleased. He completely understood what we were looking for and was confident that he could provide it. The outcome was outstanding, the wall is beautiful!! He also worked on the front yard during the same time frame as the wall. We were looking for a way to make the front yard cleaner looking; half of the front yard was covered in juniper that was balding and dying off. Kohut transformed our front yard into a beautiful rock garden. John Kohut and his employees were a pleasure to work with; we will definitely be working with them again as well as recommending his services to others. A huge thank you to Kohut Landscaping for a wonderful job, for listening to our concerns, answering all of our questions and following up with us after our projects were done." "John showed up 10 minutes early the first time we met him...enough said. We needed to totally transform our front yard and after hearing from four different..."
"John showed up 10 minutes early the first time we met him...enough said. We needed to totally transform our front yard and after hearing from four different companies we liked John the best. He listened to our ideas and came up with a beautiful design which met all our needs. Part 1: regrade the front yard, rip out old front steps, rip out old walkway, remove old shrubs. Part 2: install new bluestone walkway, install 30yds of moss rock boulders on hill, install new sod, plant over 100 shrubs and trees, install over 20 bluestone steps and finally, rebuild brick steps with bluestone treads and landing which leads to the front door. Our house is 40 yrs old and John did a great job matching the new brick to the existing brick on the house. He is very particular with how everything looks and takes great pride in his work. The crew is very friendly and cleans up every day. The communication is great and he has been by at least a dozen times over the past two months to check on the trees, shrubs and sod. Yes, he did a lot of work and it turned out amazing! We get so many compliments on our transformed front yard. I highly recommend using John Kohut & Son for all your landscaping needs."